This is two problems I’ve crammed into one comic. The gap between learning in high school and middle school is, I think, more significant than most educators give credit. I could go on about my issues with middle schools, backing those concerns up with my experience working in middle schools… but perhaps I’ll save that for another time. The “here’s a book/poem, let’s read it and then immediately afterward watch the movie” thing is just a bad practice in which WAY too many teachers indulge. 2011-2012 school year: callooh! callay! For those who have not read the poem, you can find it here. The lesson allows students to engage with their knowledge of roots and affixes to analyze the nonsense words of Lewis Carroll. It’s a fun day of class! Hey, NYC Educator took a second look at one of my posts from last week and I highly suggest you check it out. Seriously, NYC Educator is one of my favorite teaching blogs- I left New York City somewhat reluctantly a few years back and reading the posts over there allows me to keep tabs on the ups and downs of teaching in the Big Apple. 2011-2012 school year: where does he get his vests? 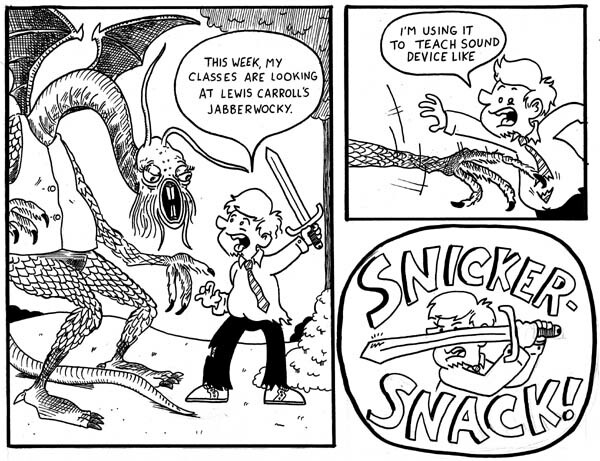 It was fun to use John Tenniel’s illustrations from Jabberwocky as inspiration for the first panel. I lavished a little more time on this comic than I usually do, just out of reverence for the guy. Last year, I wrote about one of my favorite holiday comic books ever, The 1993 Marvel Holiday Special. It was one of the first comic books I bought with my own money and thought it was worth every penny. 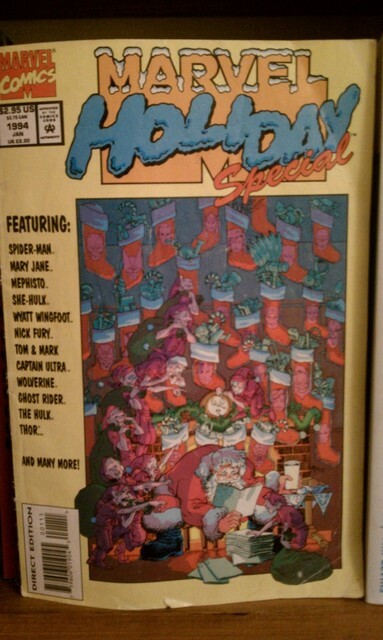 I was therefore quite excited to pick up The 1994 Marvel Holiday Special the following year. Unfortunately,’94 couldn’t hold a candle to ’93. Fewer characters, less interesting creators, and a couple of stories which made no sense added up to a disappointment. Ah, Black Friday. Some folks look forward to it even more than Thanksgiving. As I’ve mentioned before, being wretchedly poor severely curtails both a person’s ability and interest to stand in line for five hours to buy a $200 dollar laptop computer or whatever. I’ve never been big on venturing out on Black Friday until we moved to Ohio and I started frequenting Half-Price Books. Since then, I’ve been in regular attendance at their Black Friday sale wherein the first 100 shoppers receive a $5 dollar gift card. Book lovers aren’t like people looking for a good value on flat screen televisions; you’re not apt to be trampled to death by someone who’s looking for paperbacks. That being said, there is ONE non-literary Black Friday deal I would consider pursuing. Target seems to have excellent deals on DVDs throughout Friday and according to many advertisements, it looks as if they will have every season of Gilmore Girls on sale for $8 bucks today. I am a great fan of Gilmore Girls and yes, I am in possession of a Y chromosome. An ex-girlfriend of mine started me on watching GG during my college years; I expected the show to be a candy-colored nightmare based on the premise (They’re mother and daughter… and they’re BEST FRIENDS!). Imagine my surprise to discover the incredible depth of character that series’ creator Amy Sherman-Palladino infused in Gilmore Girls. Further, GG was often laugh-out-loud hilarious, with mile a minute dialogue that put one in mind of the screwball comedies of the 1940’s. 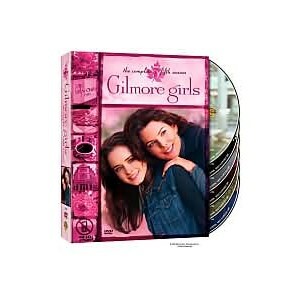 I’m looking to pick up Season Five of Gilmore Girls; I already have Seasons 3 and 4. S.5 is, from what I gather, a controversial season. Fans were (rightfully) invested in the relationship between Lorelai (Lauren Graham) and Rory (Alexis Bledel) and knocked for a loop when S.5 diverged from the usual happy pattern to find the mother/daughter at loggerheads for much of the season. Fans were upset, but I could never figure out the reason why, as the Lorelai/Rory split allowed room for Lorelai’s budding romance with curmudgeonly diner owner Luke Danes to blossom. God, I sound like such a weeny in the above paragraph! Look, trust me- it’s a good show. I’m not anxious to fight the legions of deal-lust-crazy shoppers to snag a set, but if I was going to venture out to a big box store on Black Friday, I might be tempted. I’m in the thick of Stephen King‘s newest novel, 11/23/63 right now and I’m enjoying it immensely. 11/23/63’s high concept (time traveling man goes back to prevent the assassination of J.F.K.) is fun, but I’m far more interested in the subtext of the novel. It shares quite a bit in common with my other two favorite novels of 2011, 2030 by Albert Brooks and Ready Player One by Ernie Cline. In all three of these novels, there is a pervasive feeling of hopelessness for the future and wistfulness for the past. Both Cline and Brooks’ books are set in the bloated future of the United States of America, where problems are intractable and conflict is inevitable. King’s novel takes place in the past, but the main characters machinations intend to change the course of history in a way such that America will not end up in this sorry state. All three books convey a sense of defeatism for the United States and its’ position on the world stage. King, Brooks, and Cline seem to be of the same mind: America’s best years have passed her by and the next century is set to be uncomfortable and ugly. Although two of the three novels end in an ultimately hopeful fashion (I’m not yet finished with 11/23/63), I found it interesting this message was baked into the core concepts of these books. They’re not deep ruminations on the state of world affairs; they’re ultimately light entertainment. Still, I can’t help but wonder… did every generation feel this hopeless and bleak about the future? I honestly don’t think they did, but I miss optimism in my fantasy literature. Perhaps I am simply reading the wrong books. One more thing: As with last year, Thrift Store Finds are going on hiatus for the next few weeks. Replacing it will be the Christmas Comics Cavalcade! Tomorrow and every Saturday leading up to Christmas, I’ll take a look at some holiday themed comic books. I really enjoyed writing those posts last year and I thought I’d make it a yearly thing! Hope y’all are having an great Thanksgiving Day. I’ll be spending mine at home with Ellen, the kids, and our Canadian friends who have long since celebrated their country’s Thanksgiving but will enjoy ours as well. It’s a well-deserved break from teaching for me and a well-deserved break for my students. I have a really wonderful group of young people this year; it’s one of the many things I am thankful for. …but hey, let’s not let a post here go by without some tip of the hat to the season! 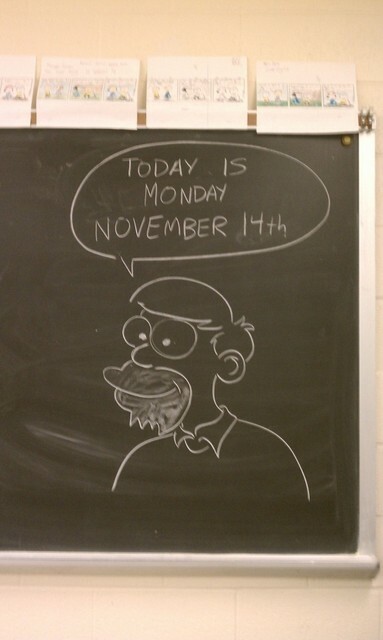 I wasn’t in my classroom to draw my typically festive chalkboard missives this year; we’ve been working in the computer lab for the past few days. 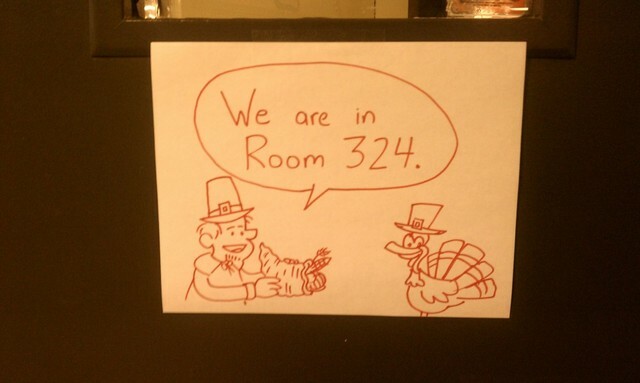 Instead, please enjoy my hastily scribbled sign, placed on my door to allow students to know where our class could be found in the days leading up to break. You are currently browsing the Teachable Moments blog archives for November, 2011.